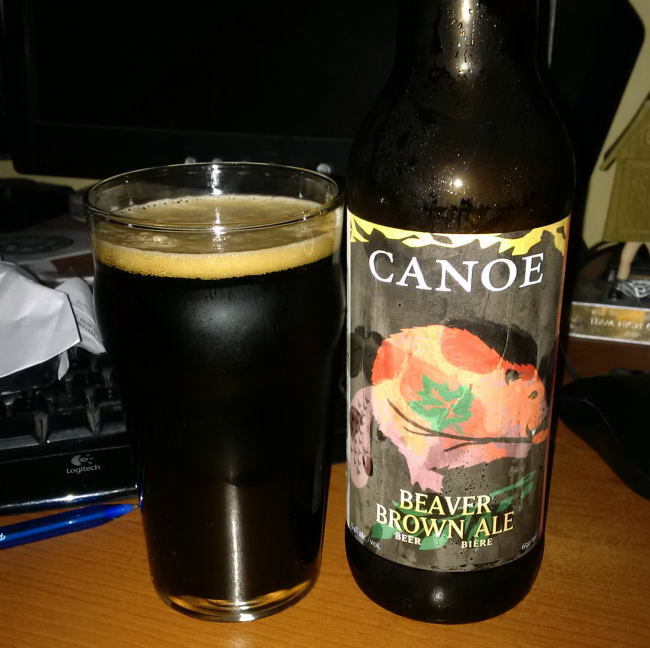 From Canoe Brewpub out of Victoria BC comes their “Beaver Brown Ale”. The beer pours a very dark brown colour with a brown head. The aroma consists of roasted malts, sweet caramel and a hint of burnt coffee. The flavour is of roasted malts, burnt coffee, some bitterness and some chocolate. Surprisingly there is very little sweetness to this brown ale. The alcohol content comes in at 5.4%. This is a good beer for sure but I think I would like a little more sweetness from the chocolate to drink this more often. Commercial Description: Our signature beer. Deep mahogany brown in colour. Rich chocolate roasted malt. Subtle and sensual with a full-bodied creamy texture. This entry was posted in Brown Ale and tagged bc, beaver brown ale, bitter, bitterness, brown ale, burnt coffee, canada, canoe brewpub, chocolate, mild bitter, mild bitterness, roasted malt, roasted malts, victoria.